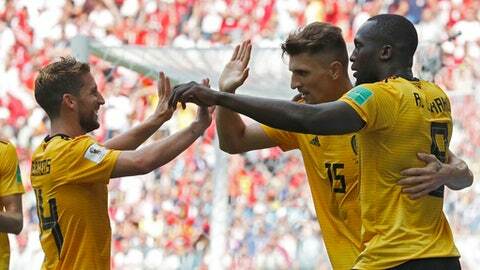 MOSCOW (AP) Belgium seems to be getting better and better – maybe even the best yet at the World Cup. It’s still early, but a hugely talented Belgian squad made a big statement on Saturday in its 5-2 rout of Tunisia. No team has scored more goals than Belgium’s eight, and only Cristiano Ronaldo can match Romelu Lukaku’s tally of four. ”In the end, we need to play better teams and have better focus,” said Lukaku, who has scored two goals in each of Belgium’s two victories. No player has had back-to-back World Cup games like that since Diego Maradona in 1986, though Argentina’s iconic captain did it in the quarterfinals and semifinals – against Belgium – before lifting the trophy. It could have been more. After replacing Hazard in the 68th minute, substitute Michy Batshuayi had several good chances before scoring one in the 90th. ”I think the whole of Belgium should celebrate,” said coach Roberto Martinez, who has overseen a 21-game unbeaten run since losing to his native Spain in his first game in charge in September 2016. ”In a tournament like the World Cup you’re only as good as the 23 players, so there will be opportunities for the other players,” Martinez said. Slow starters against Panama, Belgium got things done early on Saturday despite the warm conditions at Spartak Stadium. Hazard scored with a sixth-minute penalty kick he earned by being tripped, and Lukaku angled a low, left-foot shot into the corner of Tunisia’s goal in the 16th. The Tunisians cut the lead when defender Dylan Bronn headed in a goal in the 18th minute, but Belgium wasn’t done. A point from Belgium’s last game against England on Thursday in Kaliningrad will ensure a place in the knockout round. Belgium’s goal difference of plus-six is another big factor in the unlikely event of a three-way tie. Tunisia also used pace and direct running to expose Belgium’s defense, though tested goalkeeper Thibaut Courtois too rarely. Belgium’s King Philippe was in the VIP section to watch the game, with his two sons, Princes Gabriel and Emmanuel. This story has been corrected to show that Michy Batshuayi scored in the 90th minute, not stoppage time.